This Christmas season, I've had the opportunity of temporarily working at Barnes and Noble. One interesting thought I had while working- being surrounded by Christmas music, books, and products- was, "I feel like I have something in common with everyone here." Even though I know that most of the people shopping and working aren't Christians in the biblical sense, they are still voluntarily choosing to surround themselves with "holiday cheer." No matter where you go you hear the voices of men hailing the arrival of God. Whether our culture is oblivious to it is really inconsequential. They still habitually act every year as if there is something important about December 25th. Sure, commercialism has watered the message of Christ down; but He is sill there, and has not been ignored on a large scale. Cultural identity is really about what you have in common with the other members of your particular group. Our culture shares a common identity during the month of December. Unfortunately, we quickly regress to our individual "ghettos" the rest of the year. I feel as though every 12th month we all take a step back in time to copy the traditions of our Christian forefathers, though most of us have no clue what the real implications are. I believe we are in a sense catching a glimpse of what a Christian culture should look like, and use to look like in the Western world. A world in which Christ was honored with our tongues (i.e. "Merry Christmas" during December, and "God bless you" the rest of the year), hands (charity), and feet (church attendance). There is a certain uniformity even in our dress code (greens and reds, sweaters and hats). We have something in common, and it points to God's greatest gift. What a beautiful picture. Have a Merry Christmas! In an earlier post entitled Woman's Wrongs: When Eve Took a Second Bite I critiqued the early feminist's religious and social views coming to the conclusion that they were in essence wrong. Most conservative Christians today will grant that the feminism of the 1960s to the present (characterized by lesbianism and abortion) is unequivocally wrong, yet they will try to level their criticism by pointing back to the "original feminists" such as Susan B. Anthony, who apparently was pro-life. In the previously mentioned post, I showed why this cannot be honestly done. The pioneers of feminism, even if they all weren't as radical as modern feminists, did in fact lay the ground work for what we see today. Their goal was to obliterate gender roles, dispense with the Bible as the primary authority, and for many to usher in socialism. I still stand by these remarks, and maintain even if some of their causes were noble, their basic motivations weren't. That being said, It is understandable that I was greatly criticized by many friends and other readers for making such claims. I in a sense, had gone where no conservative Christian had (or at least not many in quite some time) by questioning the "noble" progressive changes of the mid to late 19th century. Though I as a mere sinner am capable of stating things too harshly and illogically, I am nonetheless afraid that many of my critics fail to understand something rather basic about Biblical authority. I fear that many (not all) have been privatized. They fail to see the reason for why the majority of Christians in the mid-1800s took the position I advocate, and for good reason. They perhaps view religion as one type of truth, and morality as another. Religion becomes a personal and private truth subjective to the individual, whereas morality (for conservative Christians) is an objective transcendent truth. Sure, there are points at which both may complement, verify, or overlap each other, but some issues, such as women in leadership for instance, are objectively right without having Biblical support. This is worrisome, because wherever the Bible does speak on the issue it does so usually in a negative light (the position that women can lead women, but shouldn't- not that it's necessarily a sin- lead men). In this follow-up to the previous article I would like to do two things. Number one, I would like to in a more gentle and insightful manner provide the reasons that the feminist movement came to be in the first place. Secondly, I would like to provoke my readers to find Biblical solutions for how to restore gender roles to their rightful place whatever that might be. My information will be taken from Nancy Pearcy's book Total Truth which everyone should read. In Pearcy's chapter How Women Started the Culture War , she starts off with the assertion that in our day and age the perception is that church is basically for women. In fact, statistically speaking, there are a majority of women as opposed to men attending evangelical churches. Why is this? In other religions such as Judaism and Islam there are actually more men, so we can't say that men are by nature less religious. What conclusion should we draw about this, especially upon the realizing that it hasn't always been this way? Let's take a walk through history to find out what happened, and how it relates to feminism. What did the colonial integration of work and life mean for a family relationships? It meant that husband and wife worked side by side on a daily basis, sharing in the same economic enterprise. For a colonial woman, one historian writes, marriage "meant to become a co-worker beside a husband . . . learning new skills in butchering, silversmith work, printing, or upholstering - whatever special skills the husband's work required." This isn't to say that the wife and husband functioned without gender distinctions. The man was considered the head and headship had a highly specific definition. "It was defined as a divinely sanctioned office that conferred a duty to represent not his own individual interests but those of the entire household." So yes, there were distinct roles, but they were not unconnected. So what changed? Why is it not the same way in our time? "The old pattern was based on personal relations between a farmer and his sons and hired hands, or between craftsman and apprentices. In the Industrial Revolution, that gave way to impersonal relations based on wages." So it was the Industrial Revolution that brought the change about. Men left the home to find work in the world. Women stayed home to care for the children by themselves. This unfortunately, is our modern day "conservative" ideal on traditional roles. We don't remember before the Industrial Revolution when the same tasks were tackled by both genders, when a husband and wife made a team. The new perception was that the home was a nostalgic traditional oasis of morality and the finer things in life, whereas the cruel raw world of industry came to represent coarseness and hardship. A man had to be "tough" to endure the vile pleasures and cold mechanism of the "machine," which did not take into account such things as ethical concerns but only the "bottom line." Isn't it ironic that today instead of wanting the men to come home and behave like decent human beings, the women want to go out and prove they're as tough as men? Inevitably, religion fell into the domain of the home and thus became a feminine institution. Since the home now represented "enduring values and ideals that people desperately wanted to maintain in the face of modernity . . . laws were passed limiting the participation of women and children in the factories." Work and family were now separate spheres. Men's physical presence around the home dropped, child-rearing manuals left out the father, home "ceased being the locus of production and became a locus of consumption" (women became the consumers), household industries were replaced by factories, and "women's tasks were reduced to housekeeping and early child care." Women as a result, became socially isolated and experienced a drastic decrease in the work available to them at home while remaining solely responsible for the limited range of tasks of which they were responsible. "Printers, blacksmiths, arms-makers, proprietors, and small business owners" now became the sole domain of men. Women were now charity cases if their husband's died, being unable to take over the family business. Whilst the societal ideal woman changed so did the ideal man. A man went from being a dutiful male who kept his passions in check to being a competitor. No longer was he the spiritual leader. Instead he was expected to be naturally crude, and the woman was to teach him morality for now she was the spiritual leader (remind anyone of every sitcom out there portraying a man as a crude competitive foolish hypocritical glutton, while the children and mother are viewed as morally favorable?). So the new male was a tough, competitive, pragmatic brute. This was the beginning of the end for chivalry. It wasn't long before the churches started making their pitch to women and releasing men from their religious responsibilities. It was up to the women, who came from the gentle virtuous home, to show benevolence to the world. Charity and civic duty belonged to them because they were the ones capable of understanding what true love really was. Some men were worried about the influence that mothers were having on young boys. How could a gentle woman raise a tough man? In reaction, many novels and comics, etc. came out during the turn of the century to teach young boys just what a man was supposed to be. Of course, this whole model is based on an evolutionary concept of gender and it should come as no surprise that the proponents of "animal instincts" produced a primitive and barbarous view of man. Billy Sunday and others brought in the "muscular Christianity" approach portraying a tough version of Jesus. In the 1920-30s men tried to instill this toughness in their children in urban areas by becoming "hobby fathers." The children got to go with daddy to the zoo or the ball game, but the important aspects of life like true character were left up to the mothers. Father was no longer the disciplinarian. By the time that 1980 came around the amount of time men spent in the home decreased 43% from 1960. Some women objected to their new sphere. How come men got to participate in natural selection by competing in the real world of business, while the women stayed home? Were women less evolved. Naturally, women became upset at what had happened to their economic worth. They were mere appendages to the man in society. Why not follow man into his world and compete in the same way? Some of the more "conservative feminists" saw this as an opportunity to "re-moralize" the public sphere with the morality of the private sphere. This is why you have feminists like Sarah Palin (a re-moralizer) and Hillary Clinton (a "let's beat the boys at their own game" attitude). Women are now fed up with being the moral conscience to their husbands. While he's off having affairs and doing what's expected by society, she has to sit home and twiddle her thumbs. If she doesn't regulate his sexual behavior properly, she feels as though she's the one to blame. This fed up attitude is partially what has led to women becoming as course as men. They are tired of being moral guardians of the family. Christians must not fall into the trap of assuming that paid employment is the only thing that will give women a sense of dignity. That's a mistake secular feminists often make. Instead Christians need to challenge the prevailing ideology of success by insisting that individuals are most fulfilled when they enjoy a sense of calling. Now I pose a question, which is at the heart of this issue. What should we do about this? We can't just turn the clocks back and reshape our economy to be "pre-Industrial Revolution." I would like to suggest that men will not come back to the home until they are shown by their fathers and the church that it is "manly" be a husband and father. The church must first teach gender roles correctly. Secondly, men should include women in their business decisions and economic lives, and women should include men in home life as much as possible. Men should make every effort to be home as much as possible to fulfill their responsibilities, and women should make every effort to visit their husbands at work as much as is permitted. Neither is more valuable than the other. I hope that now you can see how the Industrial Revolution and society's reaction to it led to the feminist movement, but I also hope you can see that restoring a "traditional role" view is not the solution, since such a view of gender comes from a post-Industrial Revolution conception. Instead, we must invoke a timeless standard. Perhaps the best book I've ever read outside the Bible up to this point has been Total Truth by Nancy Pearcey. Pearcey, a former L'Abri student who studied under the tutelage of Francis Schaeffer is now a professor at Philadelphia Biblical University, a member of the Discovery Institute, and the chief author of the Pearcey Report. 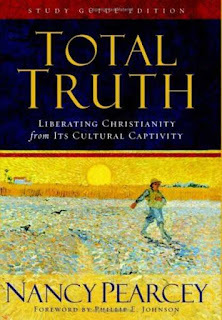 Reading the 400 page Total Truth is much like reading Schaeffer for today. The book is divided into four sections: What's in a Worldview, Starting at the Beginning, How We Lost Our Minds, and What's Next: Living It Out. Section one reads a little bit like How Shall We Then Live tracing dualistic thought from Platonic Dualism through Augustine and Aquinas all the way to our present modernist outlook. The second section deals with the Intelligent Design vs. Evolution debate in which Pearcey gives powerful apologetic reasons for rejecting a materialist worldview. How We Lost Our Minds is particularly helpful for understanding what happened to the church. Why does the church buy into a dualistic mindset? 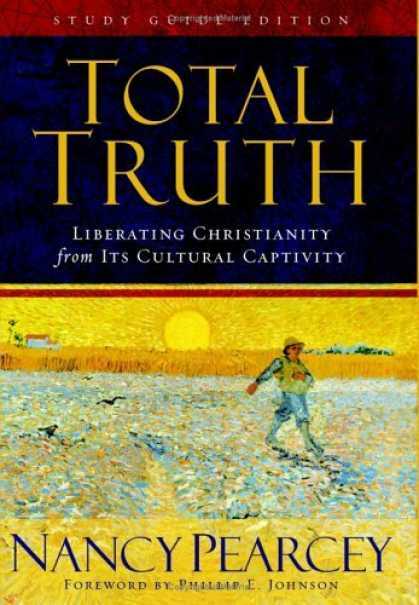 The final section is very helpful in encouraging the reader to think through the ramifications of what total truth really is, and how to apply it to life. To understand exactly what the book is about we must look to one of the many diagrams Pearcey has included to help us understand the dualistic nature of thought throughout time. The upper story is what is thought to be true for everyone or "universally true." We encounter this in the science class. We are marked wrong for mathematical error. The lower story is what is subjective and open to interpretation. We encounter this in the ethics class. It is that which relates to aesthetics, feelings, and yes, religion. So one is true for all and one is true for each individual separately. One is objective, one is subjective. One is rational, one is romantic. Though this dichotomy has taken on many different shapes throughout time from the Form/Matter dichotomy, to the Grace/Nature dichotomy, to the Mind/Matter dichotomy, today we have a kind of Fact/Value dichotomy governed by both Modernism and Postmodernism. Our culture believes that there are certain things empirically verifiable that all humans are governed by (Modernism) yet morality or values are not in this category. Everyone can choose what works (Pragmatism) for them according to their own likes and dislikes (Postmodernism). Christianity however is total truth. It is a complete philosophical system which does not recognize this distinction. Jesus is the truth, all wisdom and knowledge have their origin in Christ, all our thoughts are to be taken captive to Christ, etc. It use to be that Christians functioned this way. They knew that God had an awful lot to say about science, government, personal morality, etc. There was no distinction. However, with the rise of Fundamentalism and its offspring Evangelicalism in the mid-1800s, Christianity has been relegated to the lower story- the story of values, not facts. Evangelicals used emotions and personal experience to verify their beliefs taking it outside the realm of "science" and into the realm of "religion." It is no longer "total truth" for most of us. Pearcey challenges this conventional wisdom with Scripture, philosophy, and by showing the negative effects of such thinking. It has lead to practical atheism, the woman's liberation movement (which she spends a whole chapter on), theistic evolution, etc. Basically, the church has stopped being salt and light. But the book isn't merely and indictment against the church. It is a call to the individual (especially the college student) to apply Christian principles in every area and to show the foolishness of this dichotomy to those around us thereby shattering it. Much is said about apologetics, but much more is said about applying Christian principles to your life. The book is entertaining, easy to read, extremely enlightening, and a MUST READ before or during college.